The truth is that whilst a lot of your success in 5-a-side is reliant on the skill of your players, a massive factor in winning games comes from experience, good organisation, and playing smart. That’s where it is absolutely vital to think about the 5-a-side tactics and formation that you and your team are going to use. Good tactics can transform any ramshackle band of misfits into a competitive team that other sides want to avoid. Below you’ll find a range of formations that your team can try out, to bring that much-needed organisation and winning-structure to your games. Quite simply, spending some time thinking about this could be the single most useful thing you can do to improve your team’s chances on the pitch. Somebody has to be committed to attacking – you need someone to provide an attacking outlet and relieve the pressure from the defense. Remember, playing with depth is as important as playing with width (you can find loads more detail about this important point in our article on having a dedicated attacker, the “pivot”). Somebody has to be committed to defending – often you see teams falling apart because there isn’t a dedicated player who stays back, keeping things tight in defense. Good teams know that you need to play with somebody in this role – it’s something we’ve dedicated an entire article to in this post on the “last man”. That might sound a bit like stating the obvious, but it’s common to see teams playing with either nobody attacking, or more often nobody defending. If you play against a good team and neglect either of these principles, you’re probably going to find it very tough! The 2-0-2 formation, sometimes known as ‘the box’, essentially splits all four players in your team into the two simple areas of responsibility: defense and attack. It is simple, clear and can help develop good defensive and attacking pairings. Although two players are encouraged to push forward and two to stay back, these roles are going to need to be fairly flexible as the attackers will need to help the defense and vice-versa. Most teams attack and defend in numbers of at least three. The pyramid is more defensively structured than the 2-0-2 formation. It plays one outright striker and adds a midfielder who will need to support the attacker as well as being ready to perform some defensive duties. This formation provides balance between defense and attack, whilst also maintaining an outright striker (or pivot) and a player to stay at the back (or last man). The two midfield players are expected to support both the defense and the attack, which can help the team adapt the formation to what is needed most at any moment in time. + Can help provide discipline and responsibility. There is clearly one player with the main defensive responsibility and one with the main attacking responsibility. + Two midfielders are able to support both attack and defense, allowing either to burst forward to join the attack with the other sitting back. – Players naturally seem to prefer attacking to defending – if both midfield players focus too much on attack this will leave the defense badly exposed. It requires these players to be disciplined. – The two midfield players need to be fit, mobile, and especially able to develop a good partnership (e.g. to know when to sit-back and defend if the other goes forward). This formation is one for the risk takers! If you’re going to play like this all the time you’ve got to make sure that you score a lot of goals, because by keeping two players in attack you’re going to concede a fair few unless the other team is a lot weaker. If you are playing against a tough team then this formation could leave you exposed. + Useful for playing against weaker teams or when goals are required. + One player at the back as last man, should mean confusion-free responsibility for defending. + Better if played with a high pressing game. – Needs a lot of adaptation for defending against good quality opposition. You will nearly always be required to defend with at least three players, so consider transitioning into a diamond or a pyramid when you don’t have the ball. – If the attackers are not committed to getting back when on the defense and won’t play the pressing game then this will leave your team badly exposed. Choosing any of the above formations is a good start but if you apply it too rigidly then it probably isn’t going to work well. 5-a-side is a fast paced game and players ideally should be comfortable in filling in any role at any time – for instance, if your most defensive player goes forward then somebody else is going to have to cover for them. It’s the same if your striker is up against a defender who is comfortable running forward with the ball; then your striker might have to track him all the way back to the edge of your own area. Picking a formation should give you a rough idea of where each player should play and help everyone understand their responsibility on the pitch, but it shouldn’t be something that teams should obsess over. If a player gets dragged out of position then that might be fine, depending on the circumstances. The idea of the formation isn’t to put a straitjacket on the shape of the team, it’s just to give a basic structure, focus and balance to the play. A lot of the good teams will tell you that they play two formations, one in defense and another in attack. Some teams very successfully use a 3-0-1 in defense but then consider themselves to be using a 1-1-2 formation in attack. It can be very useful to think about your formation in these terms as it gives a dynamic system that can be hard for the opposition to follow. Our advice is to experiment with formations in general. See what works for you and if it helps to think in terms of using a different formation for defense and attack. The 11 Best Tips to Win at 5-a-side football – if you really want to get serious about being good at 5-a-side, the formation you choose is only part of it. Read the other essential tips here. Create professional looking line-ups – Once you’ve chosen your formation, this will make your team sheets look the business! I play the 1-2-1. Defender takes all goal kicks / kick ins, right side of the 2 comes short to receive pass from defender, he plays to left side or to the striker. Regarding pressing the game after a restart at the retreat line, we start off with a 1-3 formation and resort back to the 1-2-1. For me it works well but team has to be prepared to defend. What about a 1-3-0 formation? As a coach, I tend to focus on ”attack is the best form of defence” and so we defend from the front. In our league in Dublin, we have a ”retreat line” rule, whereby when the opposition goalkeeper has the ball, the opposition players must retreat behind a certain point (usually 10-15 yards), which allows the goalkeeper to play the ball out from the back. When we have this scenario in a match situation we call shape. The 3 midfielders are positioned 1 left, 1 right, 1 centre. If the GK rolls the ball out to his left, our RM gets to the ball as quick as he can. If he rolls it out to his right, our LM does the same. While 1 of our players press the ball, the other 3 (2 midfielders & 1 defender) are man marking. The idea being we win the ball up back high up the pitch and our other 2 midfielders can be brought into play. It’s a system that has worked really well for us so far, and has benefited us more than it has cost us. We’ve scored more from it than we’ve conceded, put it that way. We’ve mostly come up against teams that play 2-2-0 or 1-2-1 and so by sticking to 1-3-0 we’ve always had the extra player in midfield which has been a big help in the system working, coupled with the same players playing the same position in the same system each week. looks like a good way to do things! The high press always finds out if the other team can play. Often they can’t handle it and you’ll win it back. Only the very good teams can usually play though it. I like Diamond Tactic. By this tactic we have twice champions in our Office. The tournament is consist from 8 Team from many divisions. This is superior tactic. More attacking with 2 wings and 1 pivot. I thought of a 3-0-1 formation where one player stays in the middle/up and one player stays back, while the left centre back and the right centre back attacks more and do long passes to the attacking player (Wing backs basically). Then, if the opposition catches on to our tactic, the right/left centre back runs more with the ball and do short passes instead of long passes. This is just to switch up the tactic a bit so the opposition can’t read our plays perfectly. Also, if we lead by two goals or more, the attacking player becomes a midfielder (kind of. The attacking player just starts defending a bit more). This is to make the defense even stronger and secure our victory. I dunno, just came up with this tactic at like 1 am. I’ve never done tactics before myself so yea. Our formation depends on who’s playing. We have two great tricky players that win games on there own so if they are playing we just sit two at back. More often than not though only one or as it is for tonights game none of them turn up so we tend to play a fluid diamond with no specific pivot but we alway seem to keep the diamond shape. It’s not even something we’ve worked on. It just happens. It’s weird. The diamond is such a good formation as it’s so flexible. It allows you to play a 3-1 and a 1-3 quite easily at times as your two middle players change their focus from defence to attack. Rotating who plays pivot throughout the game makes a lot of sense if you don’t have a specialist in this position. It can certainly make it harder for the opposition if you don’t stay in set positions. But your comment about playing the 2-2 to free up those amazing front players also makes so much sense as a formation too. It’s really about trying to find a system that suits the strengths of the team. I think that’s a valuable point you’ve brought out. The team i play for seem to use 2 formations in one match, granting the apponent be good or not. we use the diamond formation (1-2-1) with the striker aimelessly running chasing the ball down. when we defend we always drop back to a 3-1 formation where the midfielders would drop to act as 3 defenders, seems to work as we win every week! 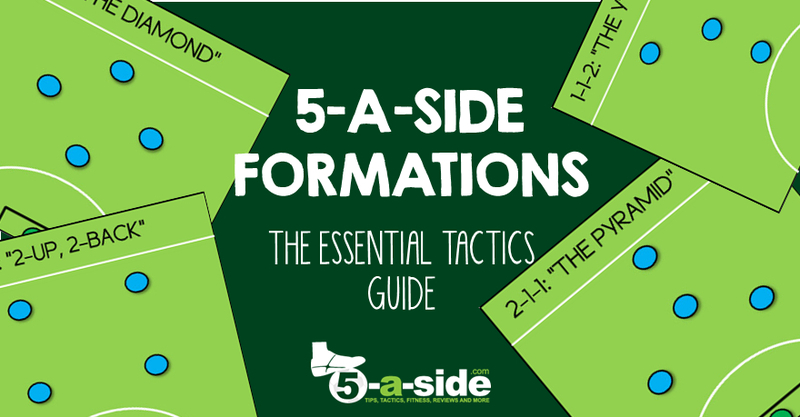 Great use of 2 formations – it’s what a lot of the best teams do. They use one for attack and one for defense. The two you have chosen are probably the most popular two to mix together. Hope you keep on winning every week!! our team played a 3-1 formation, with a sweeper, two wingbacks who need to be fairly fit to support the lone striker. Works well defensively, especially when your holding on to a lead. That’s a really tough formation to play against. A lot of people play the diamond like this. I played in a team once where we used the Diamond. We had a couple of players who just seemed to aimlessly run into the corners which was pretty useless. Eventually we realised and switched to more of a fluid kind of Pyramid system – made all the difference going forward! Attacks seemed to become a lot more incisive. Just goes to show you’ve got to pick the right formation for the players. Mind you, it always seems to end up as a 0-4-0 by the end of the game regardless! I agree, formations are very much more art than science! It’s a bit tricky to get them right and, like you say, it seems that people just head off in all sorts of directions but I’ve also used the diamond and I think it’s probably my favorite. Nice and simple, you know who’s going to be in charge of trying to get the goals and you know who’s staying back – the other two can just do what’s needed at the appropriate time.